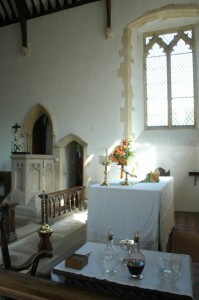 St John’s, South Moreton, seeks to be a church for the whole community, and all are welcome to our services and events. In addition to weddings, christenings and funerals, other services are held on special occasions. In 2014 these are: Easter Day Family Communion and Easter Egg hunt; Rogation Sunday service and ramble; Pet Service; Harvest Family Communion; Service in memory of loved ones on All Souls Day; Remembrance Sunday Service; Village Carol Service; Christmas Day Family Communion. The church also organizes regular social events, partly to raise funds and partly as a social focus for the village. 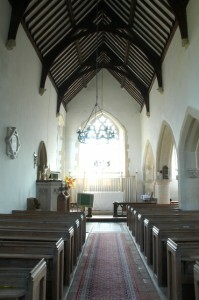 The Parish Church of St. John the Baptist at Bethabara, South Moreton. 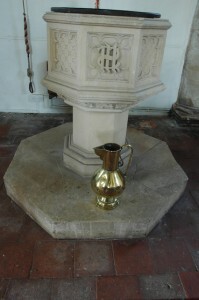 The present appearance of the Church building dates from the drastic restoration of 1849, when the roof was raised, and the font, pulpit, vestry and pews were installed.The church was originally built here as a chapel for pilgrims crossing the Berkshire Downs on their way to visit the shrine of St. Birinus at Dorchester Abbey. Much of the surrounding land from Cholsey to Appleford was marshy and impenetrable, and a causeway permitted passage over the swamp at this place. The place name Moreton means ‘village on the marsh’)The earliest part of the church is the Saxon doorway which is still visible outside the west wall of the church. The original building was a small plain oblong building. 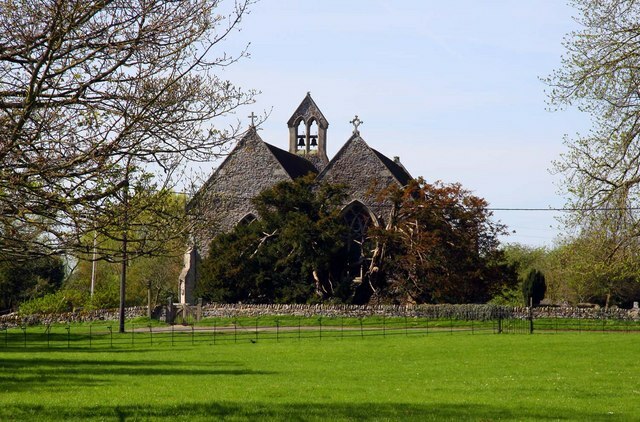 Subsequently a chancel was built to the east, and a south aisle added at the end of the twelfth century. It is not entirely clear in which order the building was extended, but the two western arches which divide the present north and south aisles are probably Transitional Norman (circa 1200 A.D.), while the two eastern arches are Early English (circa 1250 A.D.). The connecting arch replaced a medieval doorway in 1849 to make the arcade continuous from east to west. The stone corbels supporting the roof are well worth a view. They were probably carved for the 1849 restoration, but the quality of the carving is superb, and it is likely that they were the work of University masons. The light and airy feel of the building is assisted by the absence of stained glass. The north and east windows of the sanctuary are rebuilt but probably retain their original lines in the Decorated style (late 13th. century). The first window on the south side is late Perpendicular, and the second Decorated. One of the lancet windows beside the door is Early English, and the other is slightly later. The main west window and the window on the north side of the nave are Decorated. In 1976 the organ was moved to the west end of the church, and at the same time the Lady Chapel was furnished and brought back into use. The double piscina of the Early English period with two pointed arches on the south wall was revealed. The massive Yew tree at the east end of the churchyard has been certified to be 1600 years old. It suffered fire damage in 2002, but it seems to be recovering. Its survival testifies to the great length of occupation of the site. Outside the south-west corner of the churchyard wall are the remains of a Norman motte castle which is a listed Ancient Monument. It may have formed part of the out-lying defences of Wallingford Castle which was of great importance in Norman and Plantagenet times. It must remain a matter for speculation whether the dedication of the Church to St. John the Baptist at Bethabara (John 1. 28) reflects the feelings of the pilgrims on their arrival at the Church having safely crossed the brook which runs to the south of the church (their River Jordan), or its use as a site for baptism by total immersion. Rail Electrification Update No 9: Network Rail’s Public Consultation – Soon!